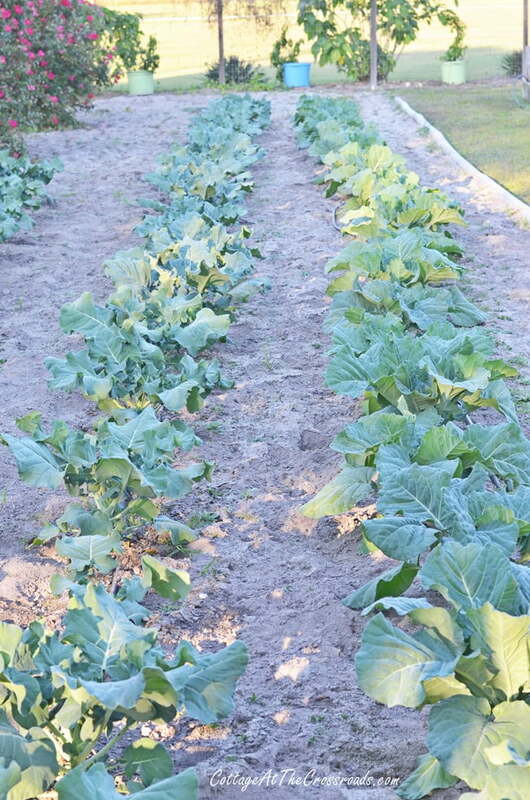 Forecasters are calling for the first frost of the season tonight, so I think it’s a good time to show you what’s happening in our fall vegetable garden. Before I begin our preparation for putting our garden to bed for winter, I think we should enjoy the fresh vegetables that are available now. Here’s a couple rows of collards. My mother always told me that collards are only good if they’ve been touched by frost so I’m looking forward to cutting and cooking some of these tomorrow. I recommend My Collard Greens Recipe. It’s a fall favorite here at Cottage at the Crossroads! Here’s just a snapshot of what’s growing in our raised beds. We’re already enjoying the mustard greens, and we have a fresh salad almost every night using the lettuce and radishes. Jane’s planning on cooking a great potato soup tonight incorporating the kale tonight. The cabbages are forming heads and will be ready soon. Man! You talk about healthy! I feel better already just thinking about it! 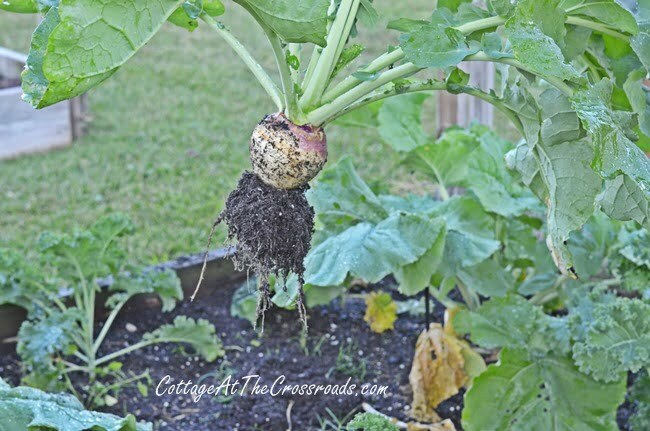 This baby (a rutabaga) has already been cooked up. Now I’m not crazy about them, but Jane loves them. This should be the last of the hoeing for the season since most of the weeds are going dormant. And when I’m in the garden, so is my best friend Lucy! 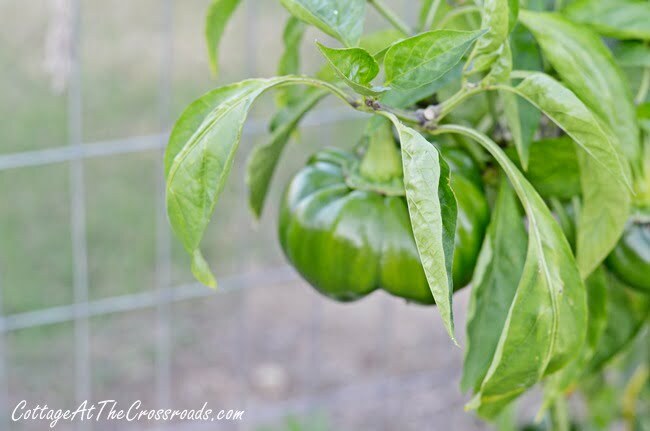 We’re picking the last of the green peppers. Just another great item in our salads. Wait! I just remembered that we had grilled onions and peppers on our hamburger steak just the other night. I’m really glad to see the okra go. We’ve had pickled okra, fried okra, stewed okra and tomatoes, grilled okra, okra in soup, and I’m up to my ears in okra. I’ve never eaten so much of it, and I’ve had enough. But, if I change my mind later, there’s plenty in the freezer. 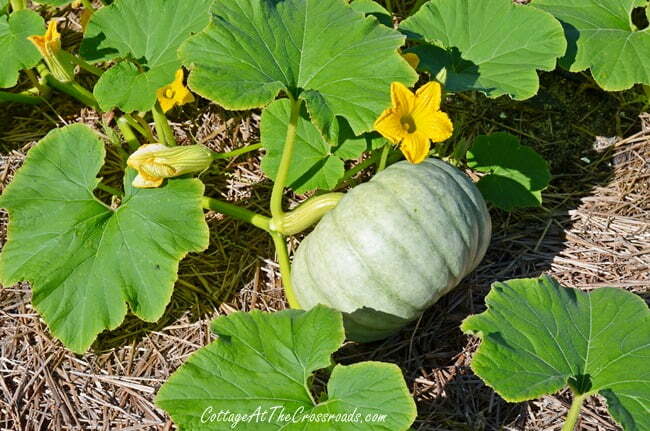 Jane planted these jarrahdale pumpkins this year to use for decoration. I love that pale green color! I think this is the coolest thing. 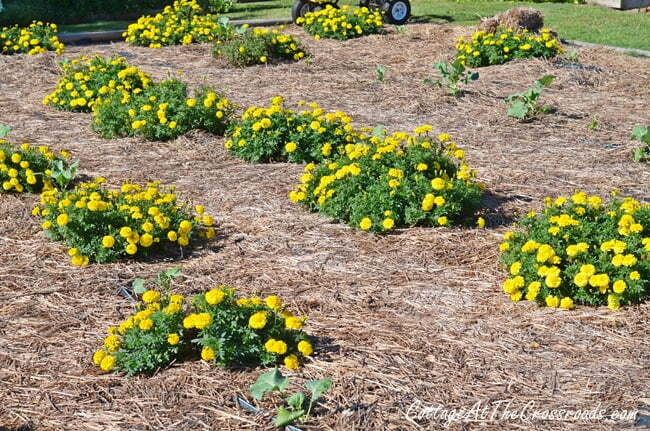 We planted these marigolds in the early spring in between our tomato plants because they are a natural pesticide. So after I discarded the tomato plants, I left the marigolds. They continue to bloom and grow right up until the first frost. I’m just a sucker for a good lookin’ flower! 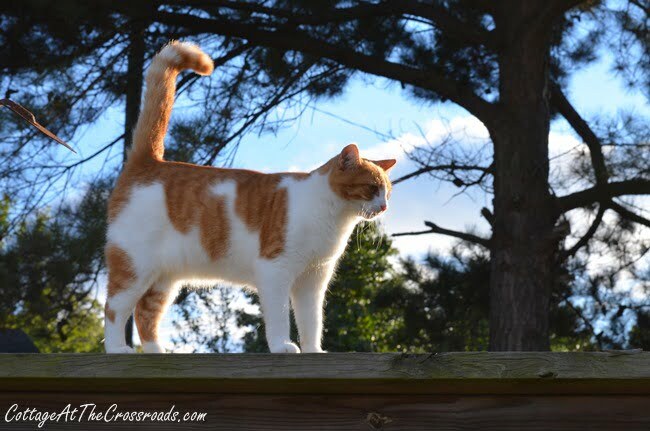 Here’s Juicy on top of the garden fence. I just thought I’d throw that in. I’ve stacked up the tomato cages for the winter. This is my fifth year using them, and I highly recommend you make your own DIY Tomato Cages. 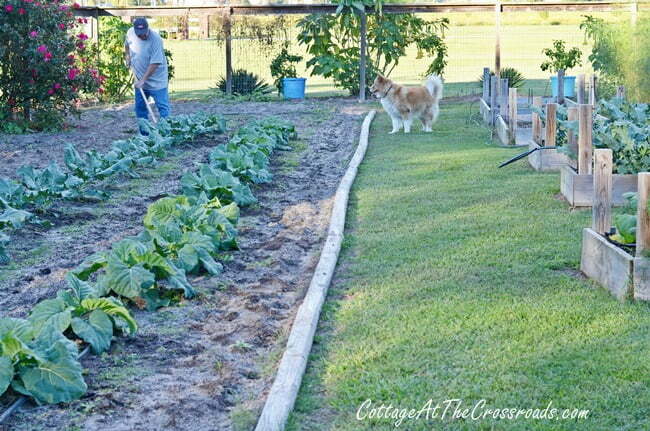 The best thing that I did in this year’s garden was to learn How to Control the Weeds in Your Vegetable Garden. 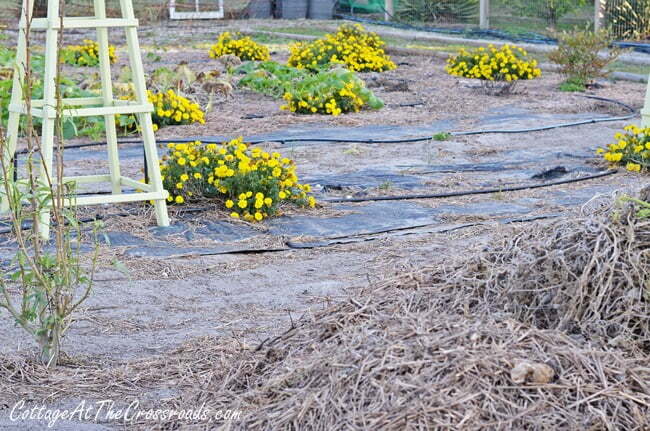 So now, for the winter, I’ll remove the straw, roll up the landscape fabric, till in some fresh compost, and let the soil sit for the winter. 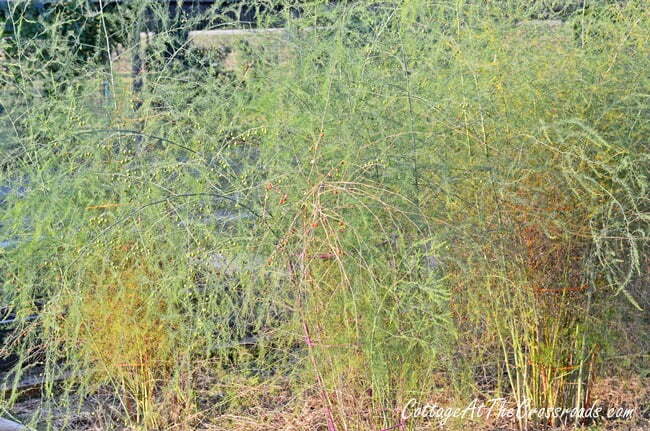 By the way, if you buy a good quality landscaping fabric, you can use it from year-to-year. 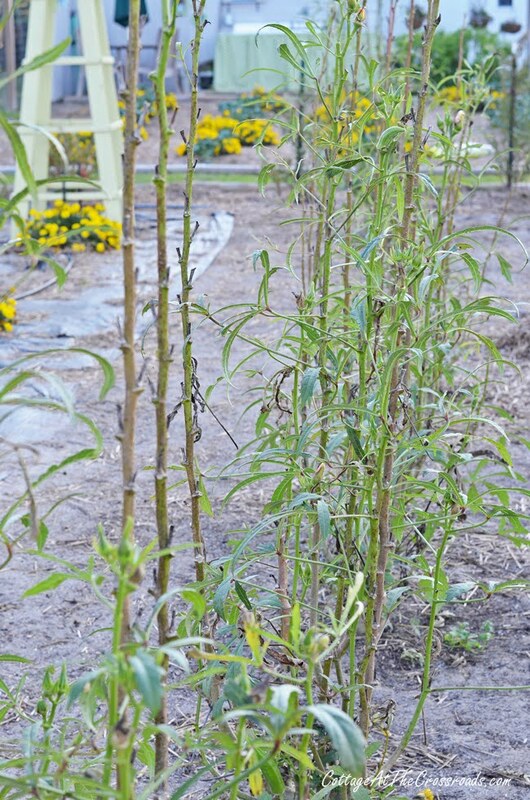 After this week of cold weather, I’ll cut this asparagus down to the ground, cover it with a layer of compost, and wait for it to return in abundance in the spring. I do love my asparagus! I think I just answered my own question! Stay hungry for fresh vegetables, my friends! Wow…the garden is AMAZING! The last couple of weeks I’ve been ‘wondering’ about having raised beds in our garden next year. DH’s family grew tobacco (back in the day) on this land for several generations. Now the tobacco sticks make great stakes for our yearly crop of tomatoes. I guesstimate that we have enough land to grow most of our own, but it is a years-long project. We get a little closer each year. Your garden is always amazing! Those collards are beautiful!!! I cooked collards last Thanksgiving for the first time in my 53 years. My Mama has always cooked the collards and turnip greens (we call it turnip salad! ), so I thought I would try it. I followed your recipe and my Mama says that the collards are now my responsibility on Thanksgiving!!! Thanks bunches!! the only thing I have left is kale – and we seem to be eating a lot of it right now. Oh and herbs – I love to go out on a cool day and pick some fresh herbs. Your garden is amazing! It always inspires me! Holy cow! What a phenomenal garden!! We live in Marietta and are new to the area. We have a lot of pines in our yard and I need to figure out what I can grow in the few sunny spots we do have! oh, so now i know what you are Jane are doing each summer day until the first frost! Wow, what an impressive garden. I don’t think alot of people realize the work and effort that goes into a garden like that. We just plowed what was left of ours down last weekend. looking forward to next spring when it starts all back again. have a great week! Leo, I can just hear your voice “talking” through the written word. You and Jane do a great job! I’m jealous of the garden! So glad to see the green pumpkins finally came along. (I sent the seeds to Jane.) I’m curious as to when you planted the seeds. The seeds I planted made vines and had blooms but never had any pumpkins. My dad planted seeds too that finally got pumpkins but they are behind yours. I’m trying to figure out the timing for next year! What a beautiful garden! And I loved the idea of the marigolds! I only had tomatoes this year but hope to get a little more organized for spring. I admire your hard work. And your Juicy is a clone for a cat we had growing up named Pop-eye. Oh, I think it is soooo worth it! And you have two green thumbs! Enjoy the fruits of your labor, Leo! And Jane’s good cooking! Thanks for the comment, Barbara. Take a look at me. Jane makes sure I don’t miss any meals! Wow, fabulous garden! 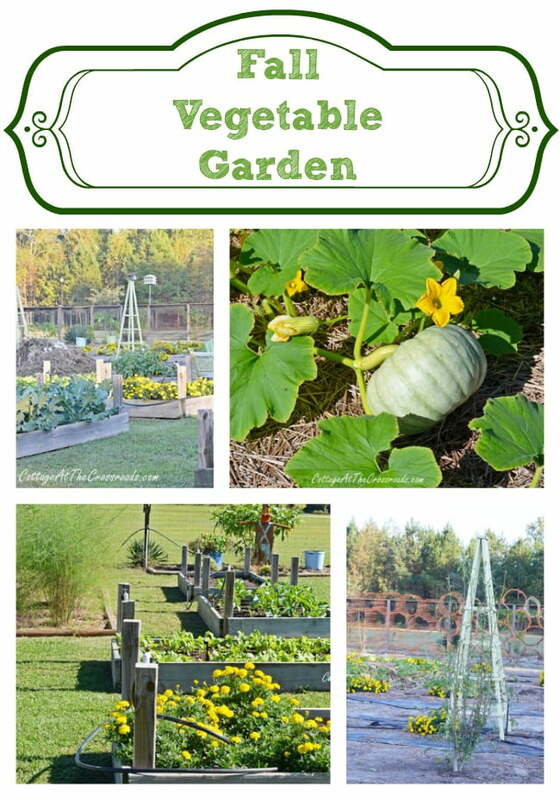 I’m curious about the taller 4×4’s at the corners of the raised beds. 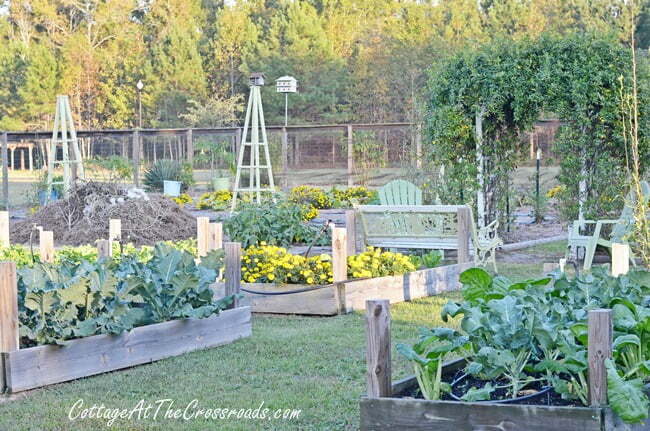 We use raised beds but have not made ours like that. 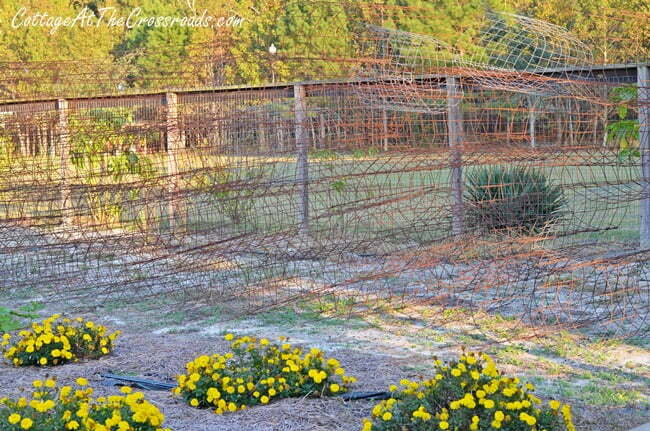 My husband thought maybe you constructed them that way to drape netting over them to deter varmints and birds. We did plant a cover crop this year and hopefully that will improve our soil some. We have two compost bins and one is almost ready to go. We hope to add chickens to our gardens next spring. It does my heart good to meet a fellow gardener. Donna, I left the extended corner posts on the raised beds to support tarps for frost protection or sunshade material to protect lettuces from the hot sun. We also have attached water faucets to one of the posts on each raised bed for our irrigation system. I haven’t tried a cover crop yet but I intend to try that. 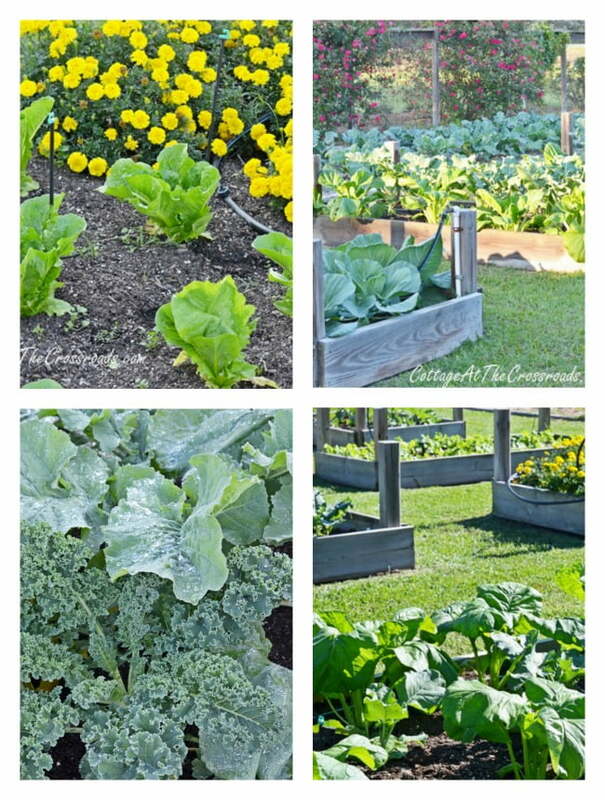 It is just beautiful, I want you to come and get my garden looking like yours 🙂 I like brussel sprouts better after they have had a light frost too. Thanks Dawn. I wish I had time but Jane keeps me pretty busy. Stay hungry for fresh veggies my friend. Thanks Kathleen. I can tell “you get it” about gardening..